I realize I am writing this in early March during the most brutal winter in our fair cities history. March will be May, and all of this will be a memory (then we can say we survived it). Anyway, I was visiting my folks this weekend and happened to see their friends house. We supplied all their lighting and appliances. I normally do not sell outside Boston, because the delivery and service is a real issue unless we control it. However, he was picking the appliances up and has a friend who fixes appliances. Outdoor kitchens are very popular in the South. It's really an extension of their home. They are becoming more popular in Boston, although they are now covered in 110 inches of snow. Over the last few years, more companies have designed products specifically for cooking outside. You can now entertain outside without using your kitchen. One word of caution: You cannot just place any product outside, especially in Boston. The product has to be rated for outside use. Let's look at a well executed outside kitchen and analyze each element. 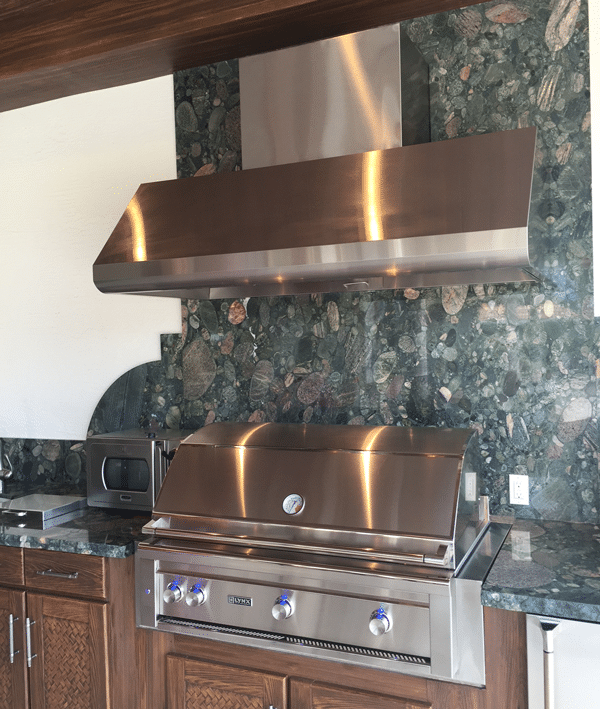 Lynx 53 Inch grill and Best outdoor hood. I like Lynx with its indestructible cast burners and all stainless construction. Lynx has the Pro Sear which can quickly sear the outside of meat, fish and even veggies. The ceramic briquettes provide even heat. There are some great grills like Alfresco, Kalamazo and even Weber with similar capability. Ventilation is important in a three season patio for the same reason it's important in your kitchen, especially with a grill. You do not want the smoke and grease on your walls and ceilings. There are very few hoods rated for outside, like this Best hood. It has to be weather resistant, sealed with stainless (rust proof) screws. 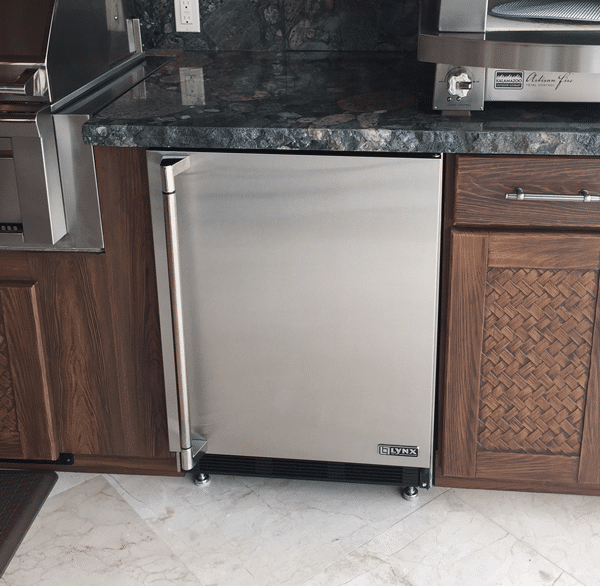 An outdoor refrigerator is another good idea, so you do not have to walk back to your kitchen during your barbeque. Every major company manufactures a weather resistent outside unit with a stainless cabinet, sealed compressor stainless screws. Look at True as all their units are designated for inside or outside. People love this unit. After a 45 minute preheat, it can bake a pizza in three minutes. 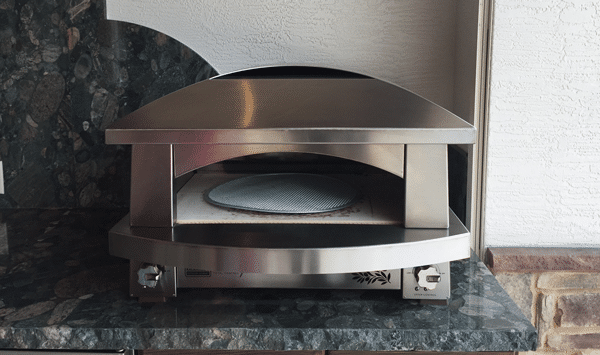 With 42,000 BTUs, it can be set for every type of pizza while emulating a wood fired taste and texture. This is a neat little accessory. 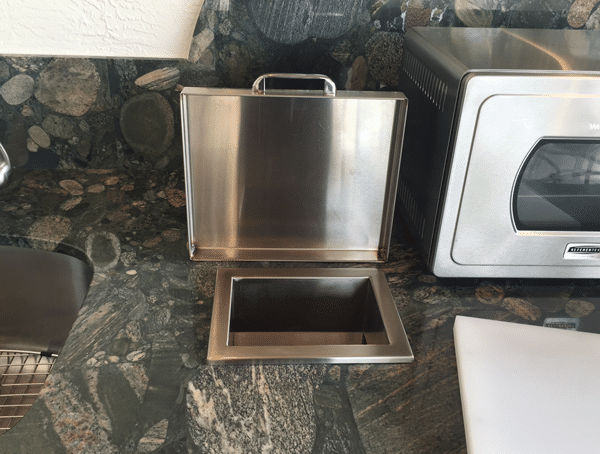 You cut a hole in your granite and place your trash basket underneath. All the wrappers, unused meats and trash are sent down the chute without bending. Great convenience item. As I said before, you can really have a kitchen on the outside, so you don't have to walk in and out of your house. 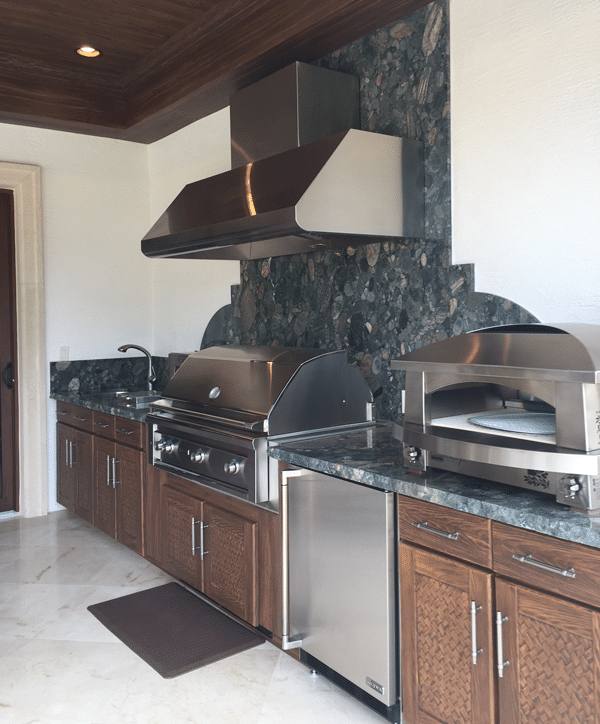 In the next few months when the weather turns (and it will) we will be posting articles about hybrid grills, smart grills and other really cool new products design to enhance your outside experience. Get our free BBQ Grill Buying Guide with tips, trends and reviews of all the best brands. Over 80,000 people have already found answers in a Yale guide.